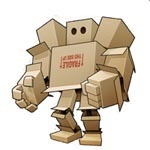 Benno's Figures Forum • Tips on preserving fine brushes? I seem to be on a spiral of buying brushes, turning their points blunt, and buying more. Considering their price nowadays, is starting to getting expensive and annoying. I have read more or less the basical tips, but all the same, I end up the same. I paint always with Vallejo and Citadel water based, and some humbrol water base. I clean my brushes with water and store them upright. Do you have some extra tip or secret to keep them as pointy and young as the first day? Xantippos, I cannot say that I have tricks for keeping them pointy, but what I have learned is that multiple brushes works well for me. I have a handful of carefully selected "detail" brushes, I have a handful of nice/decent base coat brushes, I have a whole mess of the art store mixed bag brushes for everything else. I have found that not using "my favorite" just to put paint on a figure has helped me extend the normal life of my good brushes. Would also like to hear what other members have to say on this topic. I rinse them with soapy water after cleaning, shape them while still wet and let them laying on the table to dry. I don't set them upright while still wet. Sometimes too much paint and gunk build up at the base and water won't do the job for cleaning. An acrylic thinner can help in those circumstances. This is a good question Xantippos. Long time ago I ask me the same. Bramble 15 describe very well the same way I do. Clean it simply with water. And dry it at a paper towel made for the kitchen. Tow the brush with a soft touch over the towel so that all hairs can get back in the right order.That`s it. I have read that after cleaning the brush with water you should store it with the brush side down in the water. But the brush do not touch the bottom. So you have to clamp the brush. The few pigments still in the brush can`t dry. Best way they get loose during the night. This sound very good and logic. But not very handy. After the cleaning process I store my brushes in an old cup. (A good one beside the handle was broken off.) With the brush up into the air. But the pigments who survive the cleaning process go down to the base of the brush and dry. Make the brush with the time hard. There is a live span of good quality brushing. You can stretch it to avoid dry brushing with it. Every brush is a wear and tear part ! If you paint a lot, you wear it a lot. I use the same artists brush cleaner as Ochoin and it's excellent. Clean your acrylic brushes with this, shape the bristles while wet and leave to dry. 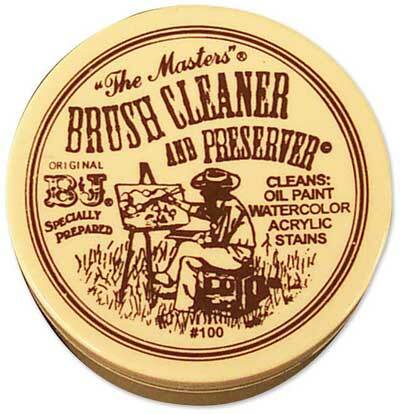 Anyone who is painting anything with enamels once you have cleaned your brushes with turpentine clean them again with this stuff to condition the bristles after the harsh effects of the turps. For artists' brushes it works for oils(after turps), acrylics and watercolours. And, I also use it anytime I need to clean house painting brushes. But I think it's good to have a separate jar just for hobby brushes. According to the instructions you can reshape an old brush by leaving the lather in, shaping the bristles and leaving to dry. Unfortunately I've run out and the shop where I usually buy it seems to have replaced it with something else that I don't like the look of. I'll try Eckersley's. Wiking wrote: I have read that after cleaning the brush with water you should store it with the brush side down in the water. But the brush do not touch the bottom. So you have to clamp the brush. You can get things like this for doing that, but, I have to say, that I have one and I don't use it much. Mostly I store brushes in empty herb shaker jars that have the larger size holes in the top. Very interesting replies, thank you. This product seems very interesting, although a bit expensive (for shipping, 30ml comes out at 10 GBP for me). So, this stuff won't interfere with the paint itself? if after the brush is clean, I condition it with it to make it pointy, and later I paint, it won't get affect the paint? And, my other question would be, one is likely to use a lot of the product or a small tin could last you forever? Xantippos wrote: Very interesting replies, thank you. This product seems very interesting, although a bit expensive (for shipping, 30ml comes out at 10 GBP for me). There are other products: go to a good art supply store & ask. After use, you're supposed to rinse in clean, warm water. I also use Vallejo Airbrush Cleaner. 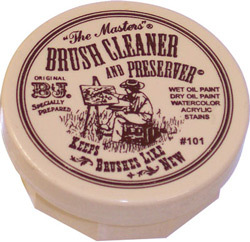 It is good for removing dry paint from brush (especially on the part where hairs meet ferrule). Unfortunately, using it reduces brush lifetime since it causes hair loss. I'm talking about Kolinsky sable brushes. For me it is essential to care but of course spent brushes really expensive. Some friend has told me some long time ago and I heard same trick from American professional painter on youtube that secret of keeping brush pointed is simple. All you have to do is use saliva. Also the good way to have pointed brush and not use saliva is to divide brushes for different use. For example brushes that you use for large areas will became fuzzy, because of the large surface and electric charge. I suggest that you take brushes you use for details and use them only for details. Also brushes that are used on larger areas are used more often. Brushes for smaller and fine details like belts and other stuff are used less because larger areas demand more time to paint, while smaller areas and details demand only a touch of paint. For example on Napoleonic uniforms painting for example a red coat jacket demands more paint and more time, while with belts I usually don't paint which much paint. I only gently make a tin layer of white twice and that is it. So the brush is wet and it won't get fuzzy. I asked my local model kit shop, but he doesn't have any special stuff. He just recommended me to after rinsing them with water, use dishwasher to finish cleaning them . I will experiment a bit more, and maybe I will persuade myself to buy that brush cleaner & preserver. I already have brushes separated into 4 categories; super fine, fine (were all my super fine end up as they are not pointy anymore), normal and big. About using saliva, I see it a bit cumbersome. I agree that a big part of the problem is letting paint enter in contact with the base of the brush (the metal part), but I find quite hard to avoid that. Then wash with clear water. Now comes the most important!!!! Then put the brushes into shape. Place the tip of the brush into the mouth, lips pointed and then carefully pull out. Sounds funny ... but after that the tip of the brush is very pointed as on the first day. Then let the brush dry with the head down. Best in a brush holder. So the wood does not swell, the metal parts does not rust and the brush hair dry quickly.. In this way, I can work with a brush very long. Also very fine brushes e.g. 1/10 size are long usable. santifernandez wrote: For me it is essential to care but of course spent brushes really expensive. I have the same. I got it as a present from my wife.